Birmingham is in a bit of a craze about the High Speed 2 rail link which is going to be built between Birmingham and London – its great news for Birmingham, it brings jobs (40,000 est) and puts Birmingham 49mins from London. They are somewhat tongue in cheek referring to Birmingham as Zone 4 of the London underground. Beneath the eye-catching 49 minute journey times is the real benefit, which is that it will free up capacity on the local lines, meaning more trains and more reliable trains, both of which are a massive issue as anyone who commutes into Birmingham on a daily basis can testify to. All that said, I am wondering if we are about to make a £22bn mistake. We are putting in technology that has been around for fifty years and is likely to be completely redundant in the next 20. One of the challenges of our railways has been that of legacy infrastructure, which has been in place since 1825, that we have had to maintain, upgrade and replace. Many countries (such as Japan) leap-frogged and put in infrastructure capable of running High speed trains (>200 km/h) from day one. It can be likened to the mobile commerce in Africa?—?many African countries are leading the way because they leap-frogged the laying of cable & fibre and just built modern 3g & 4g mobile infrastructure. They now don’t need to deal with the legacy issues that the UK does with old slow copper in the ground which is very expensive to maintain and upgrade. If there was a future-proof alternative to mass transport at speed, should we at least not consider it before committing to a £22bn project that is going to take 9 years to complete (likely much longer given that these things always overrun)? I suspect we are way to late for this but there are viable alternatives and I think history will show how stupid it was not to have considered it. I am not talking about driverless buses, cars or flying drone taxis that are all going to be viable alternatives in the next 20–50 years. I am talking about Hyperloop. Hyperloop is a conceptual high-speed transportation system originally put forward by entrepreneur Elon Musk, incorporating reduced-pressure tubes in which pressurised pods ride on an air cushion driven by linear induction motors and air compressors. 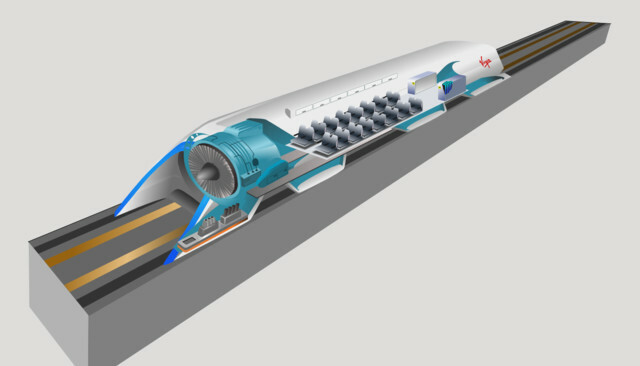 In May 2013, Musk likened the Hyperloop to a “cross between a Concorde and a railgun and an air hockey table,” while noting that it has no need for rails. He believes it could work either below or above ground. Hyperloop operates by sending specially designed “pods” through a continuous steel tube maintained at a partial vacuum. Each capsule floats on a 0.5-to-1.3-millimetre (0.02 to 0.05 inch) layer of air provided under pressure to air-caster “skis”, similar to how pucks are suspended in an air hockey table, thus avoiding the use of maglev while still allowing for speeds that wheels cannot sustain. Linear induction motors located along the tube would accelerate and decelerate the capsule to the appropriate speed for each section of the tube route. With rolling resistance eliminated and air resistance greatly reduced, the capsules are theorised to be able to glide for the bulk of the journey. Hyperloop will travel at 760 mph (1,220 km/h) so as to maintain aerodynamic efficiency; the design proposes that passengers experience a maximum inertial acceleration of 0.5 g, about 2 or 3 times that of a commercial airliner on take-off and landing. Is it far fetched or is it a viable option? Hyperloop Transport Technologies (HTT) are building an 8km test track in the Californian desert with the hope of running full tests by the end of 2016. They expect to have a passenger ready system by 2020, just 4 years away, which means we could hold HS2 to see if Hyperloop works and still build Hyperloop between Birmingham and London before HS2 is completed. Lets be honest, we all know that HS2 is not going to deliver on time, these things never do. Hyperloop is cheaper and faster. HTT have just signed (March 2016) an agreement with the government of Slovakia to build a Hyperloop, with possible links between Bratislava, Vienna and Budapest. This is a forward thinking government that is building for the future, not for the past.